Professor Peterson’s research and writing are concerned with theories of capital and property; “popular” economies, trade, and markets; health, science, and medicine studies; and postcolonial theory. She is especially interested in bringing medical anthropology and science and technology studies in conversation with African Studies and postcolonial iterations of political economy. Her book, Speculative Markets: Drug Circuits and Derivative Life in Nigeria (Duke University Press 2014), describes a once thriving brand name pharmaceutical market in Nigeria that transformed into one of the world’s worst fake (and inefficacious) drug problems. Drawing on the stories and lives of industry executives, pharmaceutical market traders, industry and academic pharmacists, drug marketers, narcotics traders, and regulatory officials, she describes the making of drug chemistries and market dynamics in the aftermath of 1980s liberalization. 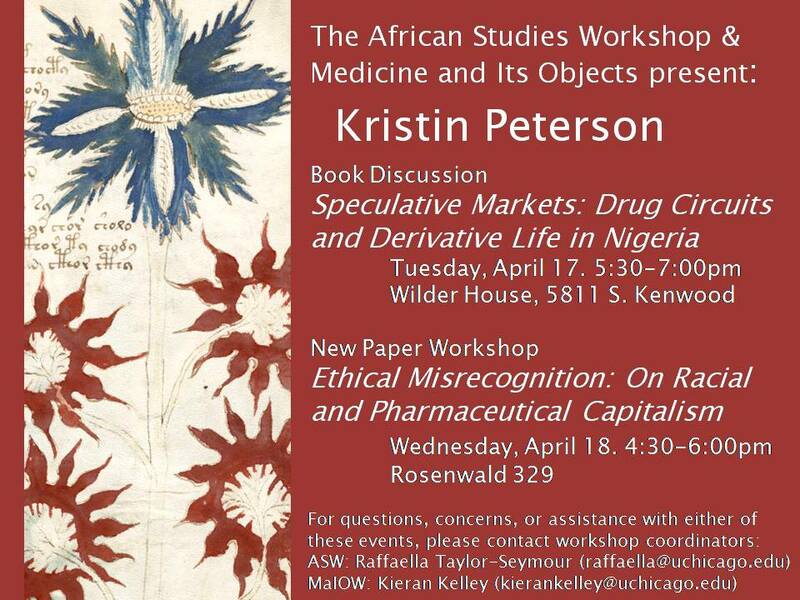 She particularly focuses on the intertwined nature of pharmaceutical industry speculation and speculative practices found in Nigerian drug markets. Both must anticipate immense market volatility while managing new risks and chronic uncertainty. In tying market actors to both local and transcontinental economic strategies, the book resituates how we think about market making and non-equilibrium theories of neoliberalism in the postcolony and beyond.